Homes for sale in San Elijo Hills are moving briskly these days. Residents here love the quaint village with its town square, outstanding schools and the friendliness of a small town. Located on a hillside just six miles from the ocean, San Elijo Hills in San Marcos, CA is a beautiful planned community with over 3400 homes–many of which have spectacular ocean views. 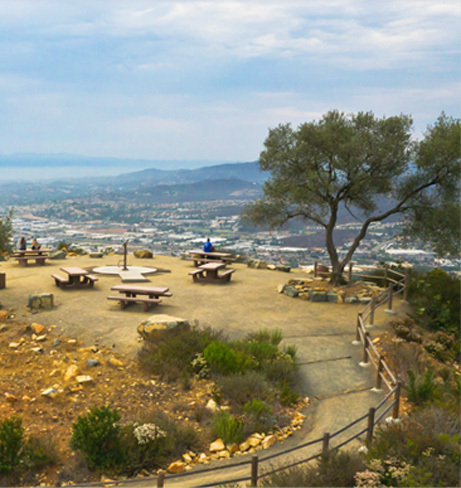 There is the San Elijo Hills Community Park as well as trails, sports fields and scenic picnic areas for family gatherings–and outdoor movies for everyone during summer months. San Elijo Hills has its own elementary and middle schools ((San Elijo Hills Elementary and Middle Schools) and just over the hill to the east is San Marcos State University and to the west, La Costa and Carlsbad beaches. Listed below are subdivisions as well as homes for sale in San Elijo Hills-with newest listings always showing first, which keeps things fresh! And below that for those who enjoy researching the area are recent sales in San Elijo Hills. Included is the newer neighborhood The Sanctuary, which offers elegant single family homes ranging in size from 2850 to 4200 square feet and priced from the $800,000’s. Builder is Richmond American. End Unit with views of the hills. Located in the gated community of Westridge this immaculate 2 bd./2bth property has a bright open floor plan with stylish laminate flooring, granite counter tops, stainless steel appliances and a cozy fireplace with high ceilings. The third floor mastersuite has a walk in closet. Master is complete with dual sinks. Enjoy views of the hills from the private patio. Resort style community pool/spa. Walk to parks, schools, town center, and hiking trails. Price Reduction!Largest Sq.ft. model in Morgans Corner neighborhood in the award winning community of San Elijo Hills. Bright and open floor plan with lots of charm. Large spacious kitchen with plenty of counter space stainless and steel appliances. 3 Bedroom/2.5 bath. Laundry room conveniently located on 2nd floor. 2 Car garage. Enjoy biking and hiking trails, parks and community pool, or shop and dine in the Town Square in the hub of this beautiful planned community. Hurry on this one...it won't last!!! Upgraded executive, end unit, townhome in a very quiet location overlooking the hillside. Newer carpet, designer paint & wood flooring. The granite kitchen has sit-up bar, stainless appliances & pantry. Features include a gas fireplace, central a/c, ceiling fans, plantation shutters or wood blinds and an epoxied floor in the 2 car garage. The ensuite master bathroom has granite counter with double sinks. You'll love the scenic views from the second floor deck with room for a BBQ. Move in condition...Supp. Gorgeous 3 story UPGRADED/Smart townhome in beautiful Magnolia at Old Creek. This property has it all. Features include bonus room at entry level great for office or den space. Kitchen boasts stainless appliances, stunning granite countertops and oversized island which is open to the dining room and living areas. Light chrome, island light. Living area has been wired for surround sound system. Beautiful interior faux wall panel was added in the Living area!! and much more! !You don't want to miss this one. This end unit town home has a light & airy feel with its southern exposure windows. Very often this floor plan is a middle location. New tankless hot water heater, AC, kitchen appliances and garbage disposal. Spacious third story loft can be used as a bedroom, office, media space, play room or more! Built in media center, window treatments and inside laundry. 2 car side by side garage. Outdoor patio and entertaining space. Walk to stores, food market, coffee shop, schools and parks. Tucked away in the heart of San Elijo Hills, this meticulously maintained, highly upgraded 2 bed/2.5 bath townhome offers style & quiet location near all the community amenities. Cozy den on entry level, perfect for a home office or play area. Second floor is an open living concept great for entertaining. Kitchen features large island, granite counters, stainless appliances. Enjoy the first light of morning or the last rays of sunshine from the private deck. Antiqued maple flooring. Award winning schools. Gorgeous 3 bed/2.5 bath townhome in the HIGHLY desired Solaire community. Ideal location on the border of Carlsbad/La Costa & San Elijo Hills. AWARD-WINNING schools, clean 2-car garage, UPGRADED kitchens, bathrooms & appliances, stunning natural light, large master bedroom with en-suite bathroom & walk-in closet. Minutes from the new LA COSTA TOWN CENTER & downtown SAN ELIJO HILLS. Private pool/spa, ample guest parking & centrally located for freeway access. CARRILLO Elementary, SEMS & SAN MARCOS HIGH. Right out of HGTV magazine, this professionally decorated home is a MUST SEE! This rare find has a magnificent two-story living room with windows allowing tons of light. The stylish chef's kitchen offers white on white cabinets, white quartz custom-made countertops & stainless steel appliances. The modern feel of white walls & light warm wood floors allows for personal design. 2 car side by side garage with epoxy & built in shelving. Secluded patio is a perfect place to relax or entertain. Pet/smoke free. Based on information from California Regional Multiple Listing Service, Inc. as of April 23, 2019 22:19 and/or other sources. All data, including all measurements and calculations of area, is obtained from various sources and has not been, and will not be, verified by broker or MLS. All information should be independently reviewed and verified for accuracy. Properties may or may not be listed by the office/agent presenting the information.